Oscar speculation is high for Glenn Close in her role here as the wife of a famous writer who has just won the Noble Prize for Literature. Jonathan Pryce portrays her husband, the pretentious Professor Joe Castleman, who jumps up and down with his spouse, Joan, on their bed when he gets the news via a phone call in the middle of the night. 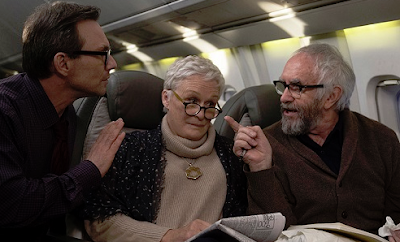 The couple fly to Stockholm for the awards ceremony, and on the flight are approached by a sly Christian Slater as journalist Nathaniel Bone, who is determined to be Joe’s biographer. Annoyed, Joe shoes him away, and even discourages him from talking to their son, David (Max Irons) as he returns to his seat. Amid the parties and intense adulation for Joe, one can sense that something is off about their relationship – much in the way of Close’s subtle reactions to the attention her husband is receiving. David, an aspiring writer himself, feels like his work is largely dismissed by his father, and shows his discomfort at tagging along with his parents to this event. Bit by juicy bit, we learn through flashbacks in which we see the young Joan, played by Annie Starke, as a writing student at Smith College. Her professor Joe (Harry Lloyd) recognizes Joan’s talent, and it’s obvious that she’s the one with the gift as he leaves his marriage for her, and she helps him complete his first novel or basically fixes it as she notes that his characters are wooden and his dialogue unconvincing. Slater’s Nathaniel suspects this, and over drinks with Joan, tests out his theory. We also learn of Joe’s affairs over their 40-year relationship, and how Joan looked the other way. Close’s performance is stoic yet layered as Joan maneuvers through her husband’s world of critical praise as the Noble ceremonies go on, and her discomfort is palpable when she listens to Joe’s acceptance speech in which he says “Without this woman, I am nothing” and attempts to paint a picture of her as his most valued muse. This disgusts her and she leaves the building with her bemused husband following, hoping to get her to come back. It’s a “behind every great man, there’s a woman” scenario, but the man here, portrayed by Pryce in one of his finest roles, is far from great. The premise involving the long suffering lady being the real one responsible with the work that has given her lover great acclaim has been explored before in such films as IRRECONCILABLE DIFFERENCES, BARTON FINK, and, more recently, BIG EYES, but THE WIFE doesn’t tread over the same ground as it has its own elegant, thoughtful, and at times an acidic approach, one that makes for absorbing emotional drama. Based on Meg Wolitzer’s 2003 book of the same name, Jane Anderson’s sharp screenplay tells a tale of resentment lurking under a highly cultivated facade, and Close plays every note with poise, grace, and an inner, yet detectable, sense of what Joan has gone through in her life, and how she finally needs to confront it. Close definitely deserves the Best Actress Oscar this time; it’s hard to believe she’s been previously nominated six times and has never won (that’s more noms without a win than any other actor). Her performance as Joan Castleman here is so masterful that it’ll be impossible for the Academy to ignore.